Paris, 30 August 2016 – Eutelsat Communications (NYSE Euronext Paris: ETL), one of the leading global satellite operators, and Télécoms Sans Frontières (TSF), a unique NGO specialising in emergency telecommunications, have renewed their partnership agreement initiated in 2007. The extension of the agreement and future collaboration was discussed today at Eutelsat’s Paris HQ by Rodolphe Belmer, Eutelsat CEO, Jean-François Cazenave, TSF Chairman and Monique Lanne-Petit, TSF Director. Based in Pau, France, and also operating from bases in Mexico and Thailand, TSF is a non-governmental organisation dedicated to facilitating critical communications services in emergency situations when terrestrial networks are disenabled, and also to providing links in extremely remote areas. Within 24 hours of a crisis TSF can be on the scene anywhere in the world to set up telecommunications centres and the IT equipment required for crisis units, with satellite at the core of the robust technologies deployed. Since its foundation in 1998, TSF has intervened in more than 70 countries, supporting the work of over 800 humanitarian organisations. 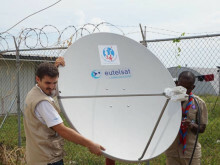 The solid partnership nurtured with Eutelsat over almost 10 years enables TSF to leverage the satellite resources and technology of a global operator to establish resilient and immediately available connectivity in areas requiring disaster relief. Eutelsat’s support of TSF’s missions has stepped up with the migration crisis in Europe and the Middle East. 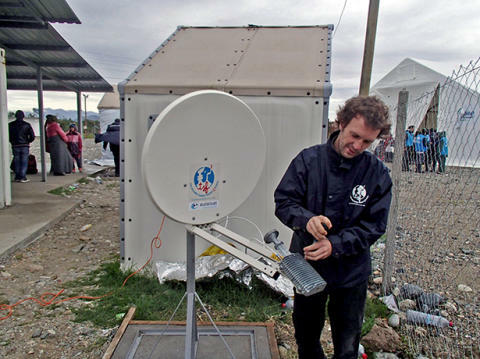 In order to meet increased need for connectivity by humanitarian organisations working in the field, including Save the Children, UNICEF, Médecins Sans Frontières and Oxfam, a dozen satellite dishes have been set up in seven refugee centres in Greece, Serbia and Macedonia. Satellite broadband terminals that are easily transported by air and set up on-site in just a few minutes have enabled more effective information-sharing between NGOs and improved cooperation with stakeholders further afield. Founded in 1998, Télécoms Sans Frontières is the leading NGO specialised in emergency telecommunications and new technologies for humanitarian response. From the onset of a humanitarian crisis or emergency, TSF deploys telecom specialists from its headquarters or from one of its regional bases in less than 24 hours. Its mandate focuses on providing access to information for those affected by humanitarian crises such as refugees and victims of natural disasters as well as reconnecting families through the provision of priority voice or internet connectivity. At the heart of the crisis, TSF teams also install emergency communication centres for aid agencies that strengthen aid coordination by providing relief organisations, UN agencies and local authorities with Internet, phone lines and technical assistance. Télécoms Sans Frontières is part of the United Nations Emergency Telecommunications Cluster (ETC) and a partner of the United Nations Office for the Coordination of Humanitarian Affairs (OCHA). In addition, TSF is a consultative member of the UN Working Group on Emergency Telecommunications (WGET) and the Directorate General of Humanitarian Aid and Civil Protection of the European Commission (ECHO). Within the framework of these operational partnerships, TSF is regularly called upon to provide training for international aid agencies in the use of emergency telecommunications for humanitarian response. Hurricane Matthew, considered the most damaging hurricane to hit the Caribbean since 2007, claimed numerous lives and devastated what it found in its path. The impact has been particularly significant in Haiti, a country where infrastructure was already limited. A new generation of satellite equipment is changing the face of connectivity for aid workers in the field during humanitarian crises. Eutelsat’s Simon Gray is in Abuja at Future-Sat Africa to present how we have designed and developed new satellite kits that are easy to transport, deploy and connect.